Home » art » Is Tap Dancing Obsolete? After watching a 1930s movie with Hal Le Roy, the tall thin tap dancer with the flashing feet, I looked for other tap dancers. Those old movie musicals always seem to include one – Fred Astaire, Gene Kelly, Bill Robinson, Ann Miller, Eleanor Powell, Donald O’Connor…the International Tap Association lists over 70 tap legends – not many still alive. In the movie, Le Roy’s character, Harold Teen, learned how to tap dance through the mail. Today, the Masters of American Dance offer a website with instructional tap video lessons. You’ll need to have a basic background to learn the dances, but they sure are fun to watch. “this number gets a wall and a ceiling. Nice and comfy in there. 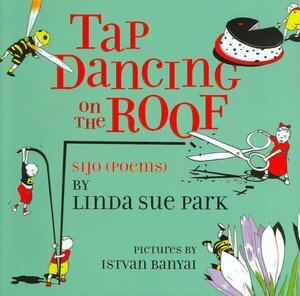 This entry was posted in art, authors, book review, books, children's books, children's literature, movies, poetry, reading and tagged A Single Shard, Ann Miller, Eleanor Powell, Fred Astaire, Hal Le Roy, Harold Teen, Linda Sue Park, poetry, Poetry for Young People, Tap dance, tap dancing, Tap Dancing on the Roof. Bookmark the permalink.